If I would make a promise to my children and they would question the integrity of what I promised, that would hurt me deeply. As a father, it is my hope that my children would have confidence in my character and my word. If they doubted what I said, then I would feel that they question the very core of who I am. I believe that the foundation of any relationship is trust. If there is no trust, then the relationship is on shaky ground. 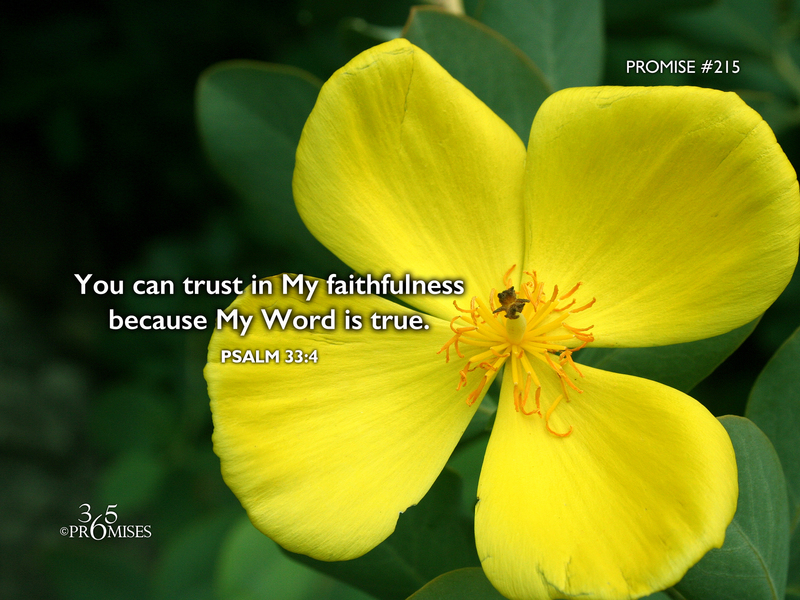 In today's promise, the Psalmist is singing praises to God and makes the declaration that the word of the LORD is right; and all his works are done in truth. The NLT Bibles says Psalm 33:4 this way... For the word of the Lord holds true, and we can trust everything he does. If we struggle to believe that God's word is true, then we are in effect doubting God's very character. Every time we question God's Word or His goodness, we are agreeing with the father of lies and the continual accusations he brings against God. Just as this would hurt an earthly father, I believe that it deeply grieves the Father of Lights. The Bible says in Hebrews 11:6 that without faith, it is impossible to please God. I believe that our God and Father loves it when His kids simply believe every word He says... Just like a little child believes everything their mom or dad has to say to them. My prayer today is that Holy Spirit would make us aware of the unbelieving thoughts that come into our mind and we would break any power of agreement with them, for the Word of the LORD is right and we can trust everything that He does and says!